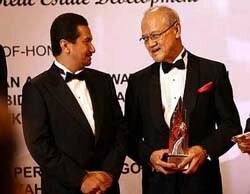 KUALA LUMPUR: Bukit Kiara Properties Sdn Bhd group chairman Datuk Alan Tong Kok Mau was named "Property Man of the Year'' at the International Real Estate Federation (FIABCI) Malaysia Property Awards 2010 yesterday. Tong received the prestigious award from the Yang di-Pertuan Agong Tuanku Mizan Zainal Abidin, who graced the event at a hotel here in a glittering ceremony attended by local and foreign guests. Bukit Kiara Properties' projects include luxury bungalows at Aman Kiara and Hijauan Kiara, a luxury condominium. Both developments are located in Mont'Kiara. Tong attributed his win to perseverance and determination. "We always need to listen to the interest of the purchasers in our daily operation. This will help a lot for the success of the business," he said. The award, dubbed the "property Oscars'' by industry players, also acknowledged nine property projects. The winners for the Malaysia Property Award 2010 included Sunway City Sdn Bhd's Sunway City Ipoh in Ipoh (master plan category), Coronation Spring Sdn Bhd's Springtide Residences in Tanjung Bungah, Penang (residential development - high rise) and SP Setia Bhd Group's Precint 3, Setia Eco Park in Shah Alam, Selangor (residential development - low rise).